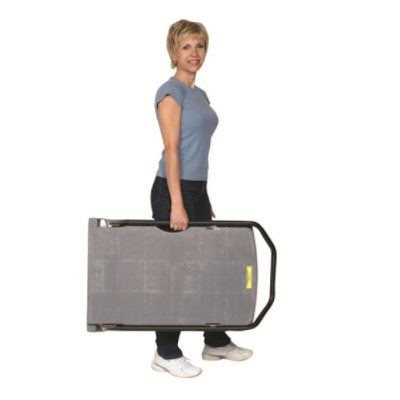 The Bi-Fold Poly Folding Handle Hand Truck is perfect for the office. It actually works in three positions. This hand truck has a handle that is tilted at an angle, which lets you use it in a pull mode or a push mode. You can also put the handle down flat to use it as a dolly. The handle stays completely flat, actually curving down over the end of the platform, never coming into contact with your cargo—which means that cargo will stay flat and firm on the platform. 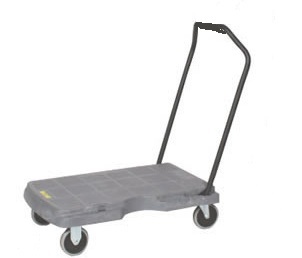 This 11lb office cart/hand truck can hold up to 400 lbs, and its platform is made of a strong material that will not rust or dent. This is a tough hand truck that won’t take up a lot of space, but will still provide the durability you’re looking for. It has two swivel and two rubber non-marking wheels. 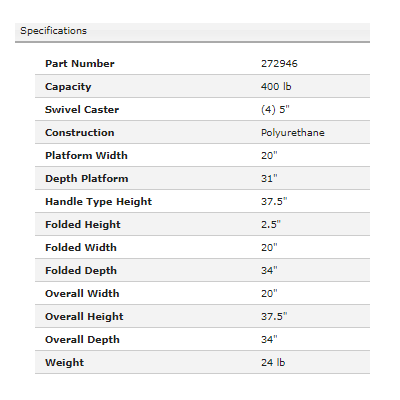 Check out another great folding platform hand truck. Look at all of our platform truck. Dolly mode - handle fold flush with surface of deck allowing truck to be used as a dolly without cargo coming in contact with handle. Cargo stays flat and secure on deck.